China. Such a vast area and such diversity, with such wonders awaiting exploration by travelers the world over. It is no wonder that so many artists and poets created work of arts and sung poems about its trove of treasures throughout different dynasties. Hong Kong Post had a series of Chinese wonder themed FDCs titled Mainland Scenery Series, which ended in 2011 with the 10th issue. With still so much to publish on China's wonders, they started with the World Heritage in China Series, with the Great Wall as the series' first focus theme. 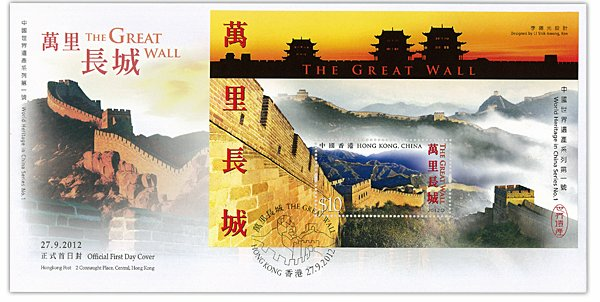 The FDC with miniature sheet affixed (above) and the miniature sheet itself (below) showing a vista of the Great Wall. Vast in size and with a long history and an age-old culture, China is abundantly endowed with natural and cultural treasures. More than 40 sites in China have been listed on the World Heritage List by the United Nations Educational, Scientific and Cultural Organization (UNESCO). Hongkong Post unveils the World Heritage in China Series featuring stamp sheetlets showcasing the natural and cultural gems of our motherland. World Heritage in China Series No. 1 features the Great Wall, long considered one of the greatest wonders, listed by UNESCO's World Heritage Committee in 1987. 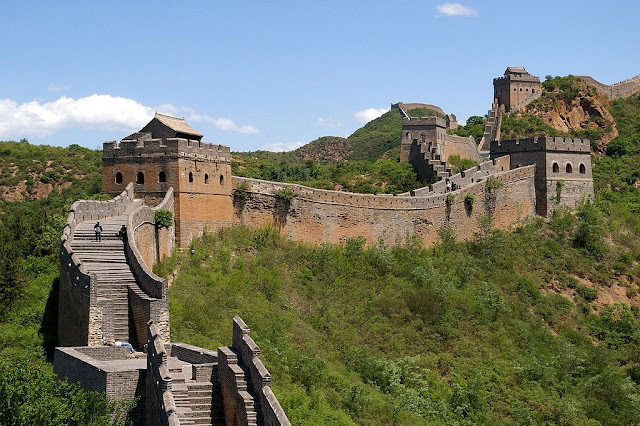 The construction of the Great Wall dates back to around 220 BC when, under the reign of Qin Shihuang, scattered fortifications built in previous dynasties were linked to form a unified stronghold on the border for fending off invasions from the north. Stretching over 6700 kilometres in total, the Great Wall comprises not only solid defensive walls but also other features such as passes favourable for defence, watchtowers used for food and weapon storage, and beacon towers used for passing military messages. The Great Wall is the world's largest military structure as well as one of the greatest ancient defensive projects. 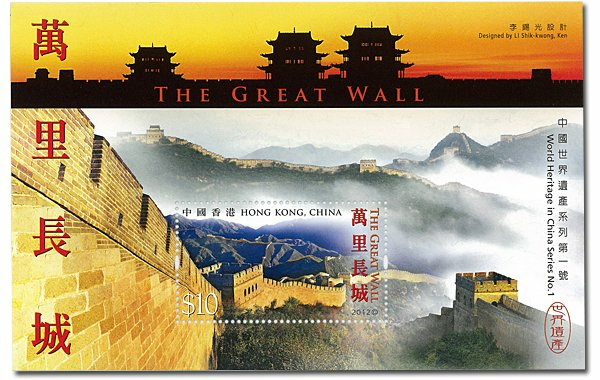 The stamp sheetlet captures the awe-inspiring magnificence of the Great Wall from different perspectives. Silhouetted against the sunset across the upper part of the sheetlet is Jiayuguan. Its imposing grandeur has earned it the reputation of being the "First and Greatest Pass Under Heaven". In the old days, it was a transportation hub of the Silk Road and a strategic point on the border. On the left side of the sheetlet and on the stamp is the Badalingsection of the Great Wall. Advantageously located and with a precipitous landscape, Badaling lies on a gateway between north and south. On the right side of the sheetlet is the Jinshanling section of the Great Wall. Strategically built on undulating mountain ridges, the Jinshanling was a natural target during ancient warfare because of its important location on the frontier. The Great Wall demonstrates the indomitable perseverance and high wisdom of the ancient Chinese, unparalleled technological advances in ancient China and the long history of the Chinese nation. How long is the Great Wall? This is how long it is... (image taken from Chinapage). The Great Wall cannot be seen from the moon, or even from space, through a naked eye. This famous myth is explained in About.com. The Great Wall was not constructed only once, and neither was it treasured then as it is now. It was conceived during the dynasty of First Emperor Qin, but was neglected thereafter. It was repaired, lengthened and improved during the Northen Qi dynasty, the Sui dynasty and as later as the Ming dynasty. More could be read here. Long the Great Wall may be, most visitors only visited certain sites of the wall, all of them close to Beijing. The Great Wall was not constructed in one go, in other words, it is not a single building. It was in fact originally many short sections of fortified walls during the Warring Period, the predecessor to Qin's First Empire. His ingenuity lied in joining them together. The Great Wall is not 'great'. In Chinese, it is 万里长城, 'Long Wall of 10,000 miles (li)'. The Chinese never say it is great. The Great Wall's purpose was to protect the then Chinese mainland from barbaric invaders from the north, but its effect was far from effective. If it was, then the Mongols would not have set up the Yuan dynasty. Maybe I will visit the Great Wall one day, but so far I have no plans to do that yet. I will just have to suffice with owning this vista of one of the grandest man-made structure on Earth. A section of the Great Wall, near Jinshanling (金山岭) (image taken from Wikimedia Commons).